The thronging thousands gathered for the last deedaar of their Syedna did not leave, despite the gates being shut after 2:30 AM. 18 lost their lives in the stampede that followed. “Bade mullaaji gujar gaye, deedaar karne jaanaa betaa,” was the first thing my mother-in-law, largely home bound because of poor health, said to me. When the news of demise of ‘The 52nd Dai al-Mutlaq of the world-wide Dawoodi Bohra community, His Holiness Dr. Syedna Mohammed Burhanuddin,’ was announced, the ripples were evident in the community. 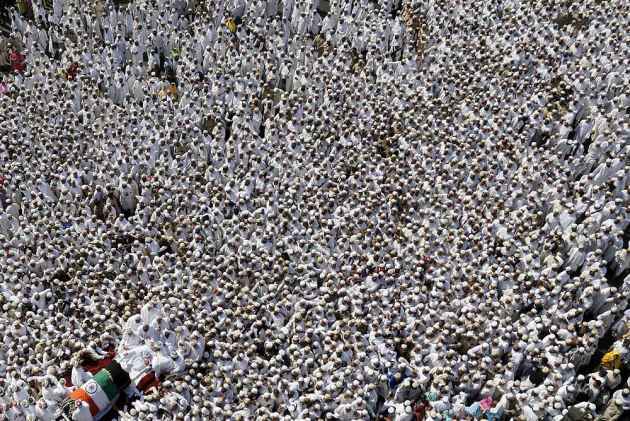 Before anybody could plan or understand the real magnitude of his demise, crowds—as if on auto cue—had started making their way to Saifee Mahal at Malabar hill, where Syedna breathed his last and the body was kept for deedaar (last glimpse). Although he had passed away in the morning, it was after early evening that crowds had started gathering. Women, children, old people, sick people—all of them—wanted to pay their tribute to the man they had been worshipping for the past 50 years. The hour of the night, lack of transport or sheer difficulty in holding on to each other, did not matter, not even to the women and children. Everyone from our family, including the old and the elderly, also tried to go—some were successful and some had to return midway because of the crowd. The gates at Saifee Mahal, spread on a huge area in plush south Mumbai Malabar Hills, had to be closed after 2.30 a.m. due to over-crowding but that did not deter thousands and thousands who were pressing against the gate. People did not leave. 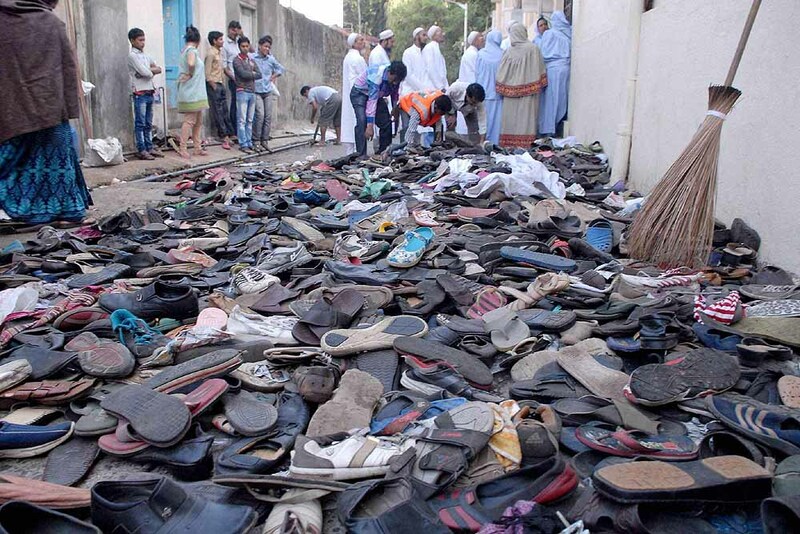 18 lost their lives in the stampede that followed, most of them, including a child, dying of suffocation. More than 40 were injured with multiple fractures. However, the following day, just as many gathered for the funeral procession from Saifee Mahal to Raudat Tahera, where he would be buried later in the day. 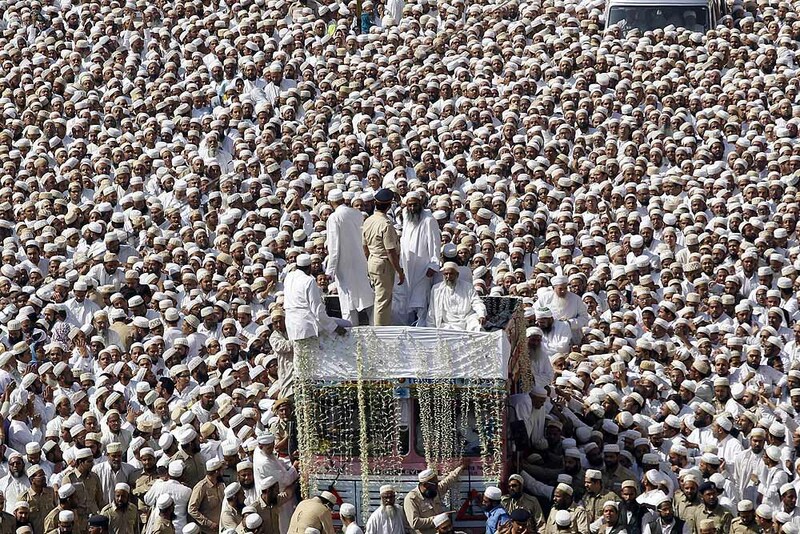 With the tri-colour on the coffin, thousands, perhaps lakhs (strangely reminiscent of Bal Thackeray’s funeral) walked in the procession, along with Mumbai Police and Rapid Action Force to the exquisite Raudat Tahera mausoleum. His father, 51st Syedna also rests here. Apart from his obvious and tangible contributions such as the Saifee Hospital or the on-going Bhendi Bazar cluster redevelopment project, Syedna’s influence seems absolute and unquestionable on most Bohris. He propagated and provided for education, health care and facilities at mosques such as Jamat cards for all members. Large donations and funds were made available from all across the world at Syedna’s beck and call. It has had the right impact on the million-strong followers—a largely happy, seemingly more modern (because of relatively higher education and colourful ridas/burqas perhaps) and practical people that Bohri business families are. With popularity among all political leaders—PM Manmohan Singh had inaugurated Saifee Hospital, Narendra Modi tweeted effusive praise for Syedna on his demise—his policies or politics were rarely questioned. Except for reformist Asghar Ali Engineer who fought against absolute authority of Syedna and practice of social boycott and an unidentified Bohri woman who started an online petition against practice of khatna for girls (genital mutilation), there were rarely any voices of dissent. For most he remains the messenger of Allah who set up grand beautiful modernised mosques (with impeccable audio-visuals for sermons to be telecast), elaborate ceremonies, hospitals and who has brought hope to thousands of poor families in Bhendi Bazar who live in pathetic conditions. People have cancelled wedding ceremonies, taken off whatsapp profile pictures, downed shop shutters, as per instructions from the mosque officials. They have also cracked jokes about becoming “chunda” (type of pickle) in the crowd. A family friend, who barely managed to come out unscathed from yesterday’s deedaar, was already on her way to the local mosque to see the live telecast funeral procession. “Jaaana toh padegaaa na. abhii khaanaa piinaa sab udhar hi milega. Abhii kuchchh din sirf mullaji ki duaa padhenge,” she said matter-of-factly. In 2011, Syedna had proclaimed Nass (investiture) upon his second son Syedna Mufaddal Saifuddin in London. The present 53rd Dai al-Mutlaq Syedna Mufaddal Saifuddin led the Namaz-e-Janaza of the late Syedna at Saifee Masjid at Bhendi Bazaar before he was laid to rest at Raudat Tahera mausoleum in Mumbai. And no, I did not get the last glimpse of bade mullaji but the glimpses of his followers weeping and performing maatam in the sea of humans will stay with me for long. Hope Syedna gives strength to the families of the victims of stampede.